This page created 22nd January 2001, updated 23rd February 2015. These histories are incomplete. They will be added to as I accumulate information. Please note: only some of these links yet work - these histories are taking a while to compile. ST1140 EYK 396  6/38    1RT chassis mounted under TD111 body, registered. 6/38-12/38 HL service running trials from Hanwell. 10/45    1RT chassis separated from RT1 body. RT19 FXT 194 10/45    RT1 body mated with 2RT chassis from RT19: registered FXT 194. 9/46    1RT chassis dismantled at Chiswick. 1978 WH delapidated at rear of West Ham garage. RT1  EYK 396  7/79    overhauled, reregistered, repainted in original livery: Last RT parade. 1983    Exported to USA, by Bevan Funnel Ltd.
10/16    at North Weald Station: "Number Ones and Odd Ones"
1/58 SW transfer into store..
11/59 NS transfer, trainer (North Street)..
10/47 AF used on 72. 1/44 F  to Chiswick for "overhaul"
H19867  11/61    preserved by Museum of Transport, St Louis, Missouri, USA. 4/14    used as extra on 15 during Tube Strike! 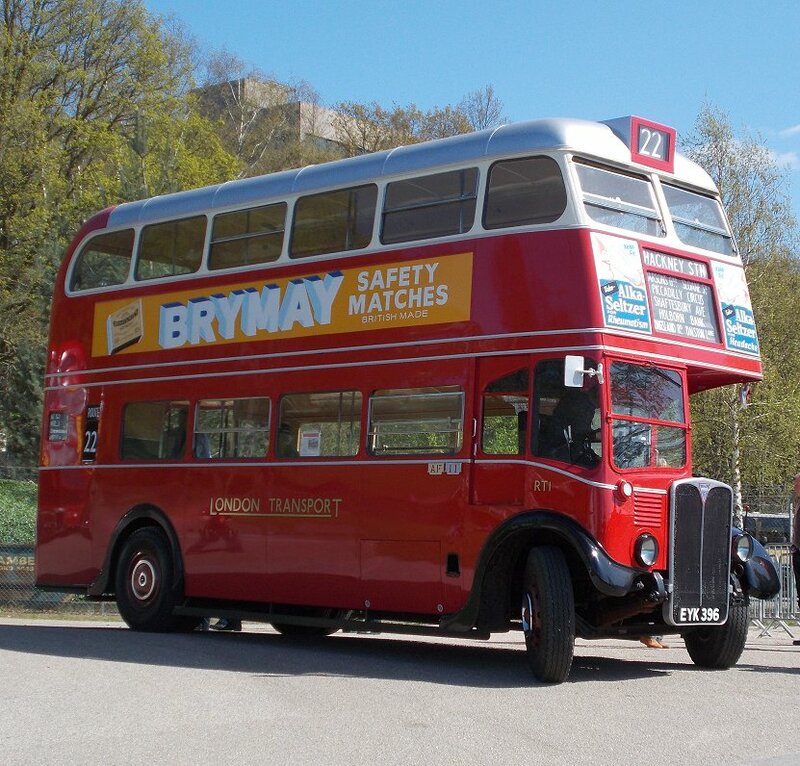 1/63 SA transfer, trainer (St Albans)..
2/66    sold to London Bus Preservation Group for spares. 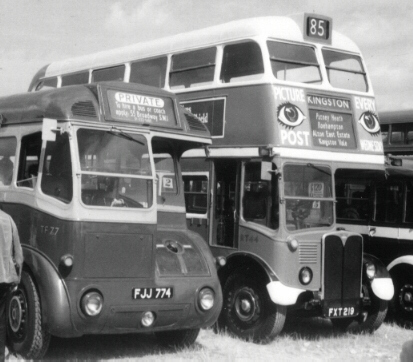 1955    2RT chassis (ex RT 19) mated with Tilling STL body. 10/65    chassis sold to L.Vass for scrap. 2/41 TL transfer for use as guardroom! 1/64    sold to Aztecs Beat Group. 7/58 CS transfer into store (Chiswick)..
11/49 B  transfer, trainer (Battersea): 3 days!.. 6/59 CS transfer into store at Chiswick..
10T10 type front wheel discs. 4/44    from overhaul still with body 299, 1/2RT2/1. wrecked body 357 (from RT87) temporarily fitted on RT52. chassis finally sent to AEC for repair. fitted with body 281, 1/2RT2. 5/55 F  on Morden-Epsom Race special. chassis to Culling & Sons (Claxton). used on Learner duties at Chiswick. 2/60    ..sold to Royal Earlswood Hospital (Redhill) for play! 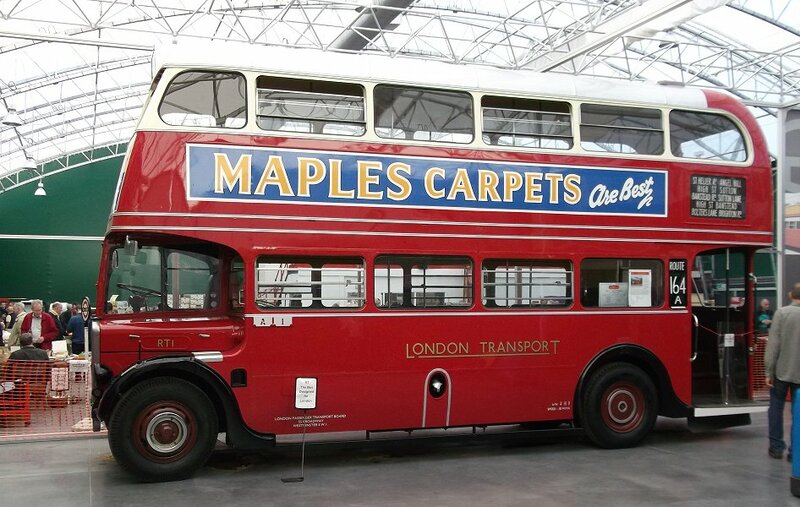 2/48 CS to Chiswick Works..
1965    to MHF Motor Organisation, Sweden. 6/44    original body destroyed by V1 cruise missile. 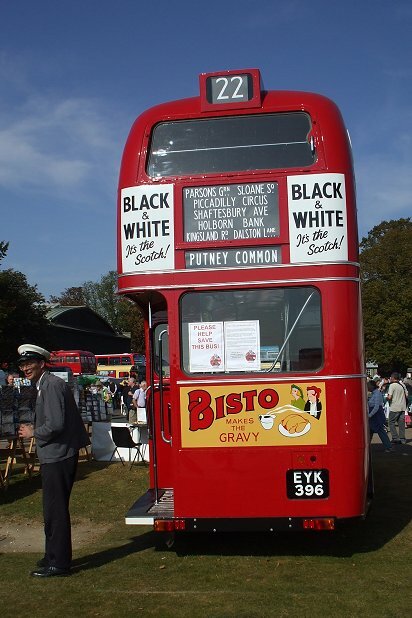 9/44    received body 357 from RT87, with odd offside route panel. then sold to Pakamatic Ltd as mobile showroom. bought by J.W.Banks (Witham-on-the-Hill), for school contracts. 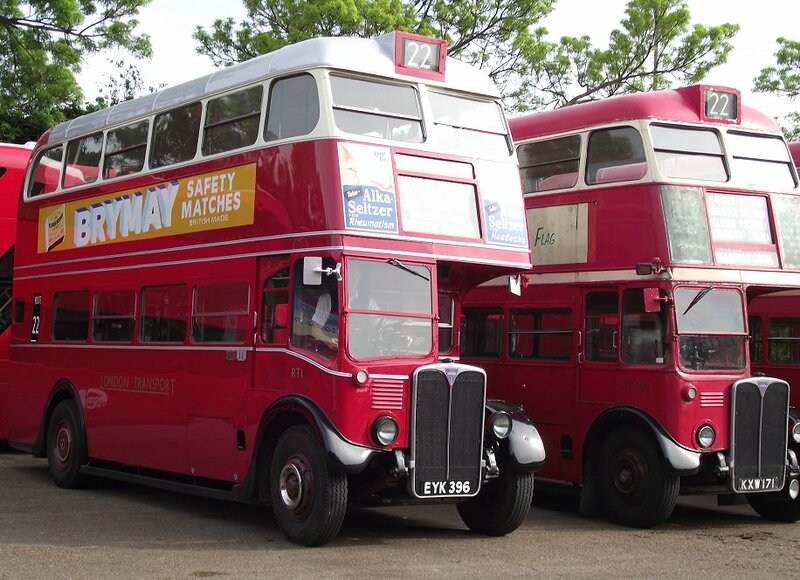 9/59 PM transfer, trainer (Peckham)..
6/48    Chiswick overhaul: fitted with quarter-drop front windows. 5/49 F  spectacularly burnt out while on 74. 3/63 FW change store (Fulwell)..
4/57    into store at Aldenham..
3/48 CS to Chiswick Works..
6/59 CS transfer into store (Chiswick)..
7/44 AF severely damaged by V1 explosion. Sent to Birmingham for repair..
platform doors, revised staircase, o/s emergency door. K  used from Kingston (K) on 65 with PAYB STLs. 5/49 RG transfer (Reigate): used on 711..
1/63 R  stored out of use, poor condition. 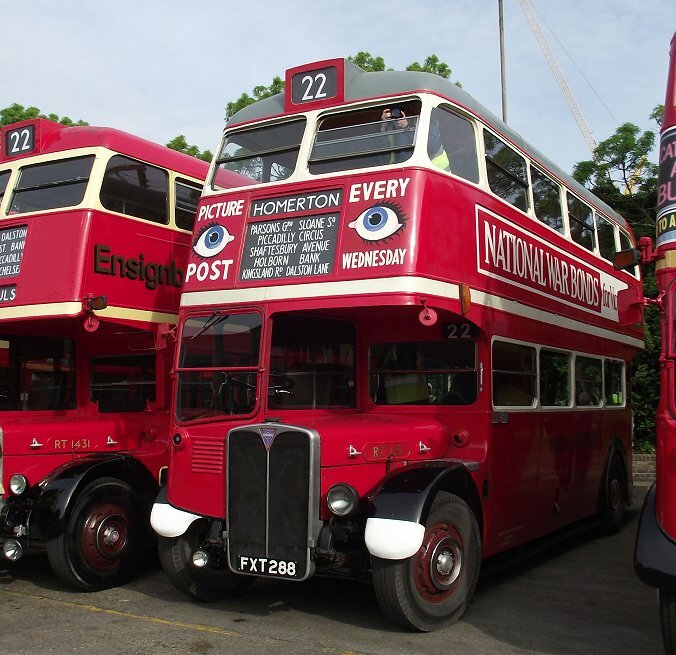 11/59 NS change store (North Street)..
4/59 L  transfer, trainer (Loughton)..
11/59 L  change store (Loughton)..
3/71    sold to London Bus Preservation Group for spares. 1954 AF received non-standard front box. 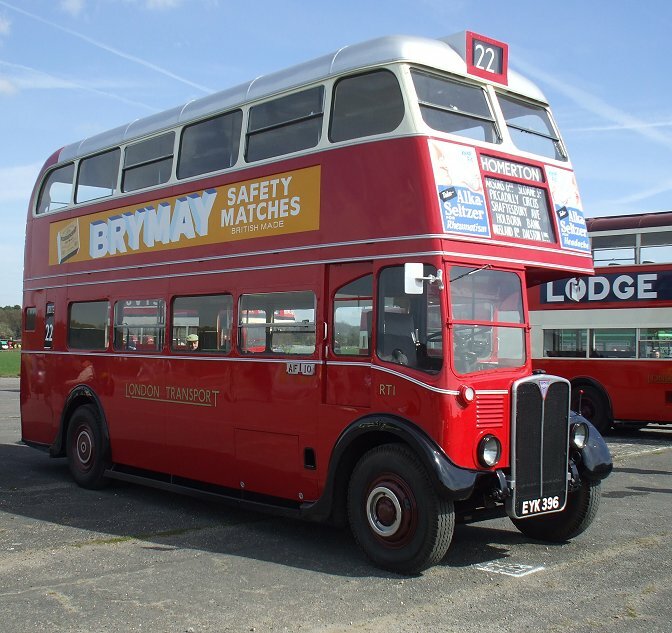 4/63    sold to Civil Defence Officer (Croydon B.C.) for exercises. 9/59 AV transfer, trainer (Hounslow)..
sold to Hoyle (Wombwell) for scrap. 10/62 J  transfer, trainer (Holloway)..
10/59 HD transfer into store (Harrow Weald)..
9/59 V  transfer, trainer (Chiswick)..
4/60 W  change store (Cricklewood)..
10/59 AL transfer, trainer (Merton)..
8/55 HG allocated to Hertford, in RED, as cover. 6/60    sold to F.Ridler (dealer), W11. */60    sold to J&A Contractors Ltd (NW.London): dismantled. 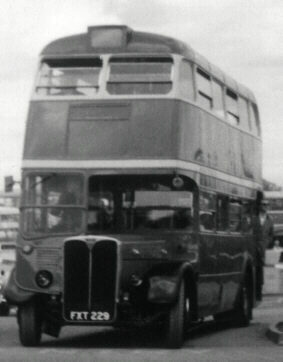 11/58 WL change store (Walworth) ..
11/58    ..change store to Aldenham..
engine acquired (from RT44). Body frame poor. 9/72    taken over by Tarmac Construction.